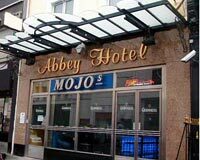 Less than a minutes walk from O Connell Street you will find The Abbey Hotel located in Middle Abbey Street. The hotel has a reputation for combining the charm of a small hotel with the standards and professionalism of a large hotel. The hotel provides a high standard of accommodation and many guests return time and time again. The guest will not be disappointed as The Abbey Hotel is renowned for its quality of service and attention to detail. The beautiful en suit rooms in The Abbey Hotel have all the facilities necessary for the modern guest. The rooms are fitted with remote control televisions, direct dial telephones, hairdryers and trouser presses. Exceptional effort is made to ensure that every comfort and tranquility is provided for the guest. The Abbey Hotel is home to the Black Abbot pub which offers a memorable dining experience. From the full breakfast menu to the excellent dinner menu the guest will be spoiled for choice. The hotel offers the finest local and international cuisine prepared from the finest of fresh ingredients and offered at very reasonable prices. The Abbey Hotel is excellently situated within a short walk of Henry Street and Talbot Street where guests can shop until they drop. And just a step away is the world renowned Abbey Theatre well known for its excellent performance of plays by Irish writers like Sean O Casey and John B Keane.